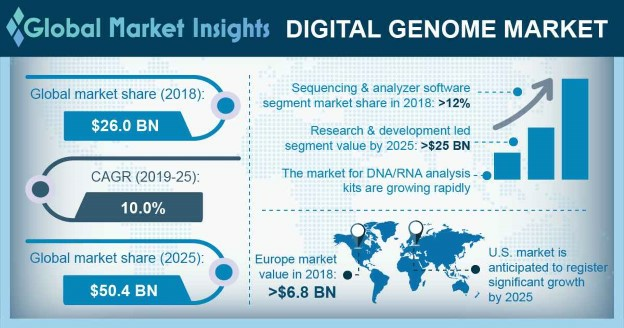 Digital Genome Market size was over USD 20 billion in 2015, with expectations to witness around 9.5% CAGR from 2016 to 2024. Speed and accuracy of human genome sequencing should revolutionize personalized healthcare by enabling individual to determine unique genome sequence. The collection and storage of such quality metrics data will drive digital genome market size over the forecast period. Reduced cost and high speed for DNA sequencing are forecast to drive growth. Increase in the number of public and private investments, funds and grants has encouraged the development of new sequencing and analysis techniques. Advances in the clinical interpretation of digital genome will provide for more efficient disease management strategies as well as enable diagnosis of many undiagnosed and rare disorders. Increasing investments and funding for life sciences research will drive the sequencing & analyzer instruments demand over the coming years. The segment accounted for over 40% of digital genome market share in 2015. Sequencing and analysis software should witness 9.8% growth due to technological improvements in software packages for production and analysis of sequence data. A large number of software tools are under development for increased data automation. Growing concerns regarding protection of patient’s genetic data, inadequate trained staff and lack of clarity on return on investments likely to have a growth restraining impact on the market. Research and development led the digital genome market share, with projections to surpass USD 23 billion by 2024. Growing number of public and private investments and surge in research funds should drive industry expansion. Microbiology applications held over 22% of the revenue in 2015 with expectations to reach over USD 10 billion by 2024. Increasing industrial, biological and clinical application of microbes should accelerate segment growth. Biopharmaceutical companies contributed more than 45% to the digital genome market share in 2015. Extensive application of genome sequencing technologies for development of targeted therapies should spur industry growth. Other industry segments such as hospitals, research institutes and diagnostic laboratories should strive to seize business share over the coming years. Academic research institutes are set to witness high growth owing to increasing funding from investors for development of novel technologies, instruments and services. Early investors are trying to reap significant profits by investing in relatively new and less explored ecosystem. U.S. digital genome market share was more than 80% of the North American revenue in 2015. The well-established healthcare infrastructure, discovery of new genome sequencing technologies and increasing geriatric population will contribute towards revenue growth. Russia market size was over USD 290 million in 2015 and anticipated to exhibit healthy growth due to presence of many companies competing to capture maximum industry share. The launch of Genome Russia Project aimed at creating a web-based database for whole genome sequences from different regions will also stimulate industry growth. Brazil market will witness healthy CAGR over the forecast years. Favorable regulations pertaining to clinical and genetic testing and the launch of public unified system should propel industry growth. Some of the key companies providing products and services in the digital genome market are Thermo Fisher, Perkin Elmer, Qiagen, Illumina, Becton Dickinson. Agilent, Sigma Aldrich, Fluidigm, Pacific Biosciences, F. Hoffmann-La Roche, Agios, AVEO Oncology and Biomarin, BioReference. Strategic acquisitions, partnerships, geographic expansion and new product launches are the most commonly resorted tactics by most companies operating in the industry. Genomics is the most rapidly evolving area in medical research and is anticipated to transform the healthcare system in the near future. Developed countries are adopting genome-based technologies in several areas of healthcare. Technological innovation will continue to remain a focus area over the next few years. Industry players are investing immensely in R&D processes to offer distinguished solutions and gain competitive advantage.